Channelrhodopsin (ChR) was the first light-gated cation channel to be discovered from green algae. Since the inward flow of cations triggers neuron firing, neurons expressing ChRs can be optically controlled, even within freely moving mammals. Although ChR has been broadly applied to neuroscience research, little is known about its molecular mechanisms. 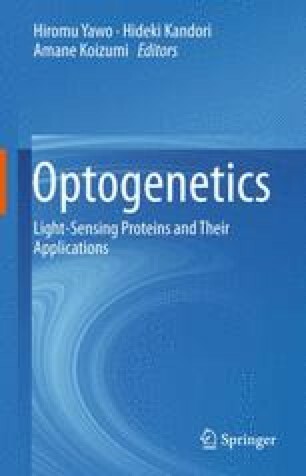 In this chapter, we first describe the simple background of rhodopsin family proteins including ChR, and how optogenetics technology has been established since the discovery of ChR in 2002. We later introduce recent findings about the structure-functional relationship of ChR by especially focusing on a paper about the crystal structure of chimeric ChR (C1C2). After we explain the molecular architecture, the initial photoreactions, the ion-conducting pathway, and the putative channel gates of C1C2, we use three recent studies as examples to further explore the possibility of the structure-based engineering of ChR variants with properties that are more ideal for use as optogenetics tools.